We all fall into bad habits from time to time, often without realizing it – unless you have especially candid coworkers and friends. Let’s save aside the more extreme cases that routinely get mentioned; often these aren’t habits at all, but rather conscious choices to be a terrible employee. For the record, though, don’t put in 3-hour days, trash your employer on your I Hate My Boss Tumblr or spitefully steal staplers from the supply closet. Here are a few common bad habits that float around workplaces like the flu. Are you guilty? I’ll admit my own guilt as we go along. Almost everyone fancies themselves an able multitasker, but hardly anyone is as good at multitasking as they think. If you have three big things to do today, you’re better off devoting time to each of them individually – and then checking your email – instead of trying to be a circus juggler. You don’t need to be passed out at your desk like our stock photo friend to be guilty of this one. Some of the hardest workers in your office are probably overcaffeinated insomniacs. Eventually, though, those lost hours will take off a little of your edge. Related: if anyone knows of any magic potions to keep a toddler sleeping, please leave a comment below. Passion for your work is fantastic, but don’t become so attached to your PowerPoint deck that you start tipping over desks when a colleague cuts a few slides or tweaks your text. Let’s be honest: everyone likes a yes-man, at least for a little while, at least when we’re the ones receiving the “yes!” Eventually, though, the yes-man’s praise rings hollow or, worse, manipulative. At some point in your professional life, you’ll probably experience a frustration or two. Don’t expect your boss to intuitively know that you are feeling undervalued or overworked. If you have a great idea or suggestion, don’t always wait for it to be solicited. If you have limited access to your supervisor for whatever reason, be prepared and prioritized so you can maximize your access. 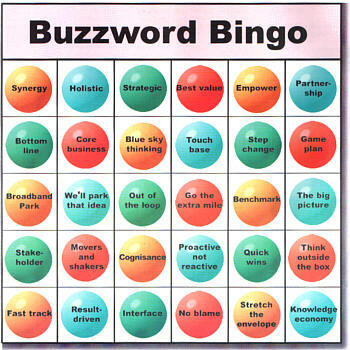 Don’t be the winner of buzzword bingo. The immediacy and filter-free nature of modern communication caused a renaissance of rudeness. I have a lot of experience working remotely – in many cases with coworkers I never met in person – and a little civility can go a LONG way. In a few cases, it impacted my likelihood of hiring someone again. Remember that tone doesn’t always translate, so be careful with sarcasm when you don’t know your audience. Don’t worry: we’re not abandoning you here. We’ve also taken a look at HOW to break bad habits at your workplace. Multi-tasking is super ineffective. Turn off your email for one hour and go somewhere else to work…makes a huge difference.